This emotional photograph captured during a wedding at Liberty Grand depicts the exact moment before the groom saw the bride. In this image, the bride is positioned on the left of the frame while the groom is waiting behind her. Often, on the wedding day, the bride and groom are so eager to see each other that sometimes they do it so fast that the wedding photographer has no time to capture the moment. That is the reason why during my consultations with the bride and groom I coach them so that we can create splendid images. Here, I instructed the groom to pause when he was about 3 feet behind the bride. He could smell her perfume and see her from behind. The bride also sense his presence. I let them wait for about 10 seconds to increase the tension. During that time, I was able to capture a series of photographs from different angles in this particular one made it into the wedding album. I said it probably 100 times before and I'll repeat it again: light is the most important ingredient in wedding photography. Motion and emotion come next, followed by technique and posing. What separates the professional wedding photographer from an amateur is a thorough understanding of light. Light conveys special moods, enhance's the couples beauty and can hide flaws. Fortunately, at the moment when this photograph was taken, the clouds covered the sun. That created a soft light that eliminated any harsh shadows and had a flattering look. 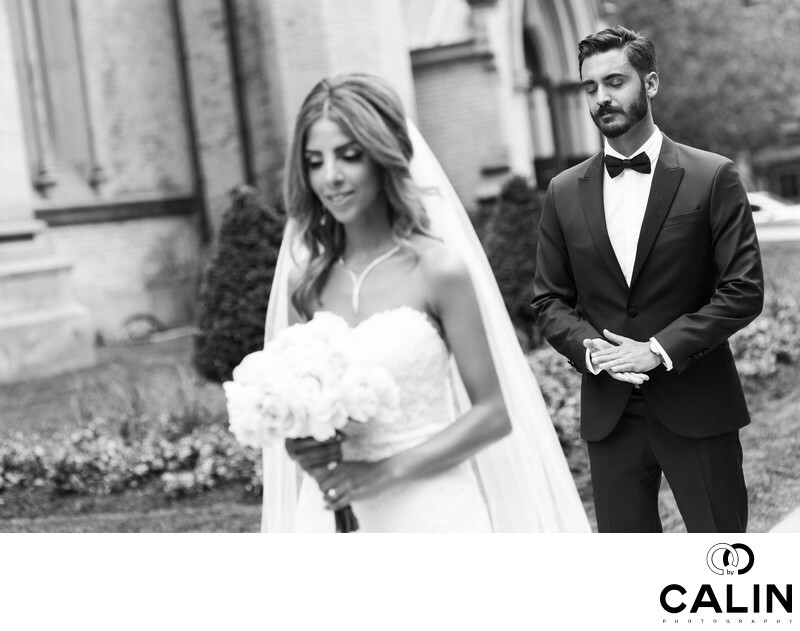 Many Toronto wedding photographers jump into this industry without the complete understanding of light and the events occurring on the couple's special day. That is a recipe for disaster. The greater Toronto area offers plenty of beautiful locations and millions of challenges. It is the professional photographer job to document the wedding day in any type of weather and the light conditions so that the couple's photograph great. In this particular photograph, the focus is on the groom who is featured here clasping his hands, with his eyes closed, anticipating to see the love of his life. To give the image a sense of motion, I employed a technique named the Dutch tilt in which the photographer rotates the camera by 5 to 10° so that the straight lines become oblique. That gives photograph dynamism. Also the subjects body become leading lines towards their faces, the most expressive part of the frame. Many wedding photographers in Toronto overuse this technique, which nowadays has a bad reputation. In fact, there are many online publications that absolutely abhore the Dutch tilt and decline any weddings that employ that technique. Like everything in life, using moderation, the Dutch tilt can enhance good wedding photograph. To capture this moment, I used a Fuji XT2 camera equipped with a 23 mm 1.4 lens. The photograph captures a special moment between the bride and groom, so I wanted to eliminate any distraction. As such, in post production I eliminated a few elements in the background and I chose a black and white processing. That eliminates the distraction generated by the callers, allowing the viewer to focus on the moment. Also, this emphasizes the documentary feel of the image and fits perfectly my photography style.